If you are the sort of person who plays high impact sports, the risk of your teeth becoming injured increases. 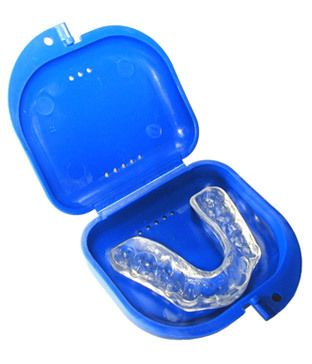 You can protect your teeth from damage and injury with comfortable, custom-made Lansing sport guards. Enamel is the hardest natural part of your body, and protects your teeth. Despite this natural protection, your teeth can still become damaged or wear down over time. Athletes that participate in extremely physical sports put themselves at risk of injuring their teeth in body-to-body collisions or by constant clenching or grinding. At our practice in Lansing, we offer sports guards to help protect your teeth. They are custom-made according to the shape of your jaw and mouth so that they can fit comfortably over your teeth while you wrestle, play hockey or football. But sports guards aren’t just for athletes. We offer guards for people who suffer from bruxism, or excessive grinding or clenching of the teeth while they are asleep. Teeth can become chipped or loose through excessive bruxism. Bite appliances, which are also called occlusal splints, are designed for bruxism patients. Like sports guards, they slip over your teeth to correct bad bite problems and to provide a cushion for your teeth to grind into while you are asleep. If you need more information about Guards, Bite Appliances in Lansing, contact us today.